Successfully Added Samsung S7 Edge External Battery Case - 5200mAh Power, Flip Stand, LED Indicators, Light Weight, Premium Build to your Shopping Cart. Ensure your Samsung S7 Edge Smartphone has enough power to keep going all day and beyond with this 5200mAh battery case. Designed especially for the Samsung S7 Edge this case fits like a glove. With a 5200mAh, not only will the case bring hours of extra life to your Smartphone but it can also keep you Smartphone safe from knocks and bumps. A rear flip out stand lets the case support your phone when you want it to stand freely on a desk or flat surface, great for watching your favorite TV shows or movies wherever you are. With 4 LED indicator lights you can see if just how much charge is remaining in the power pack case. Made from premium components with a soft to the touch finish this case is sits comfortably in the hand and is easy to grip. At just 129 grams and built to remain as slim as possible this case is a great addition to your Samsung S7 Edge and wont weigh you down. 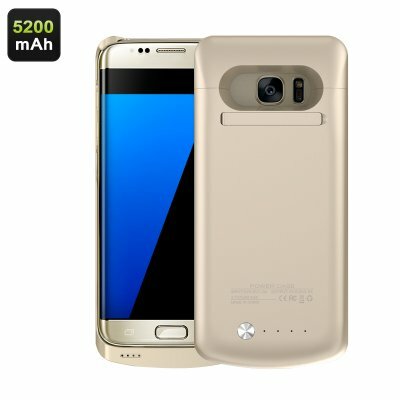 This Samsung S7 Edge Battery case comes with a 12 months warranty, brought to you by the leader in electronic devices as well as wholesale Smartphone accessories..